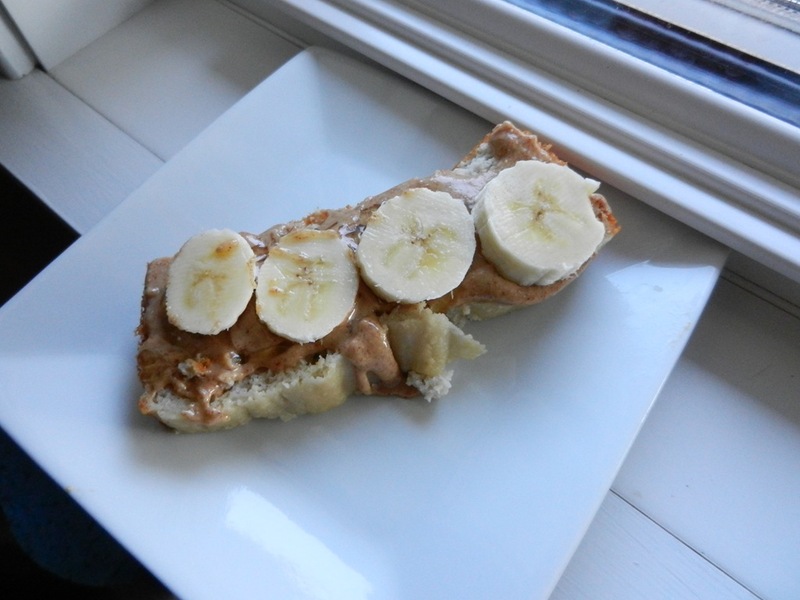 Breakfast: Almond bread with almond butter, honey, and banana slices. I went back for a round two slice without the bananas though. Run: Breakfast did a great job of fueling me for a great 3-mile run around the neighborhood. I took it nice and slow and it actually felt like good run for once. It’s been a long time since I could say that. I am excited to start incorporating more of it into my routine again. My next race is a 5k at the end of August, and I am going to be ready! Lunch: I salivate over these salads. 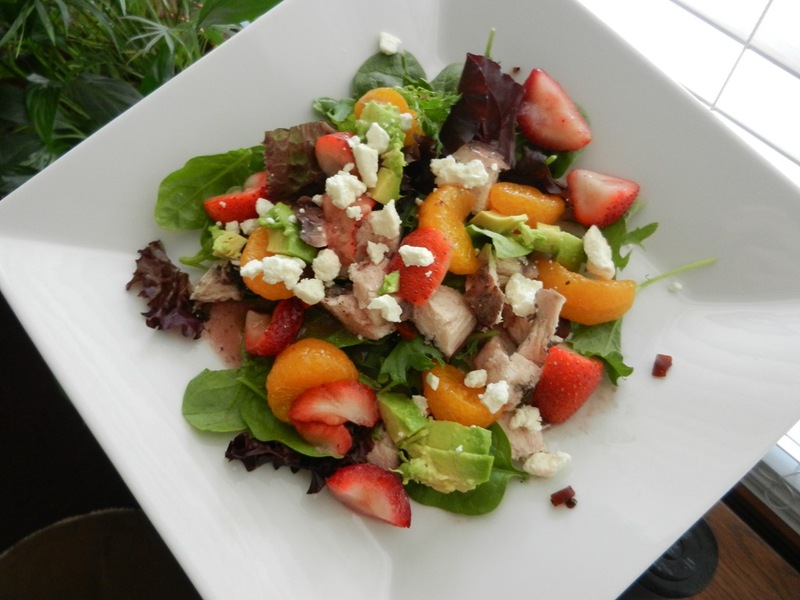 Mixed greens with grilled chicken, strawberries, avocado, mandarin orange slices, feta cheese, and raspberry walnut vinaigrette (Newman’s Own). Insanely delicious. These are the salads I have been missing all summer. It’s time to make up for lost time. Dinner: Quinoa with kale basil pesto. For the pesto: food process two small handfuls of fresh kale, about 2-3 tablespoons (I used 7-8 small leaves) of fresh basil, 1 1/2 tablespoons of garlic olive oil, garlic powder, and salt until well blended. 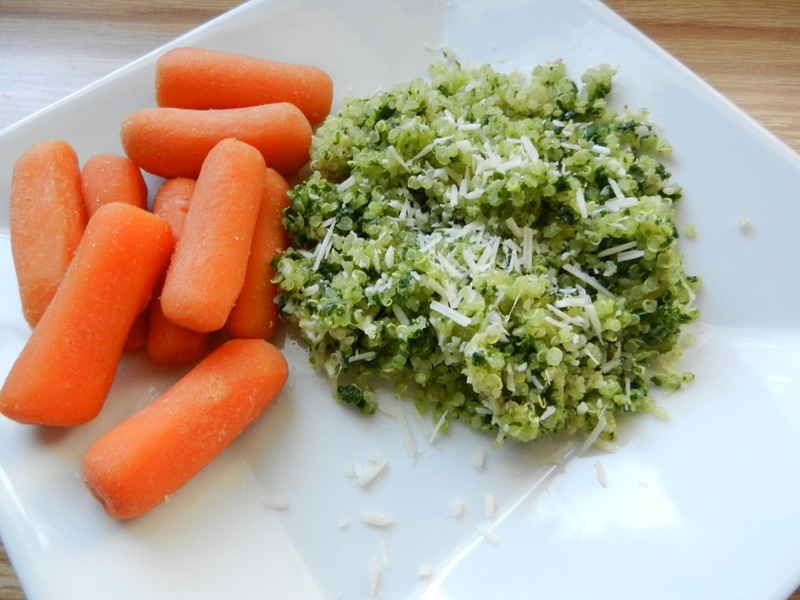 Mix the pesto in with cooked quinoa, top it with parmesan cheese, and you have yourself a winner winner quinoa dinner. Our evening was spent watching the Olympics. My favorite is still gymnastics, but I am really loving the volleyball (except it makes me so nervous), and synchronized diving. I love it all though, really. My husband’s crazy love for the Olympics is starting to rub off on me a little bit. The second recipe comes from Sunday night. 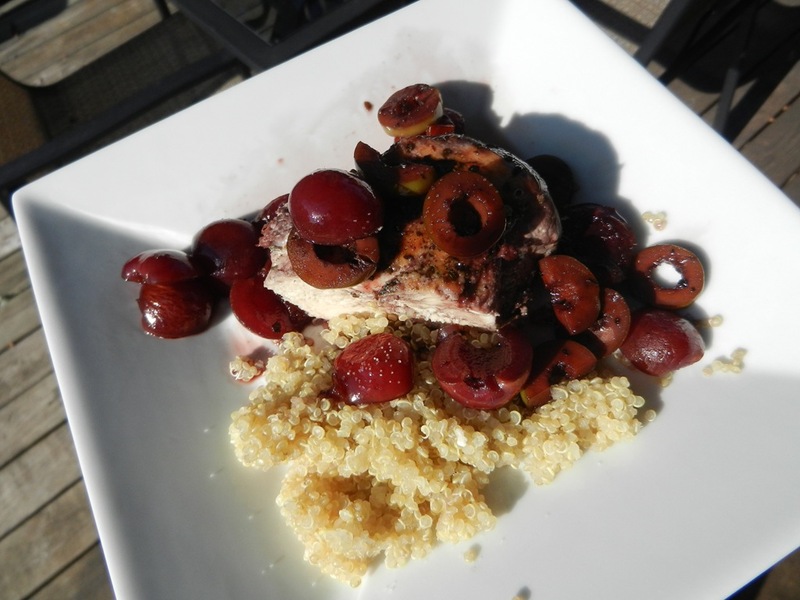 I scanned our fridge for dinner ideas and after seeing the cherries and olives, I thought hmm…I could do something with that. 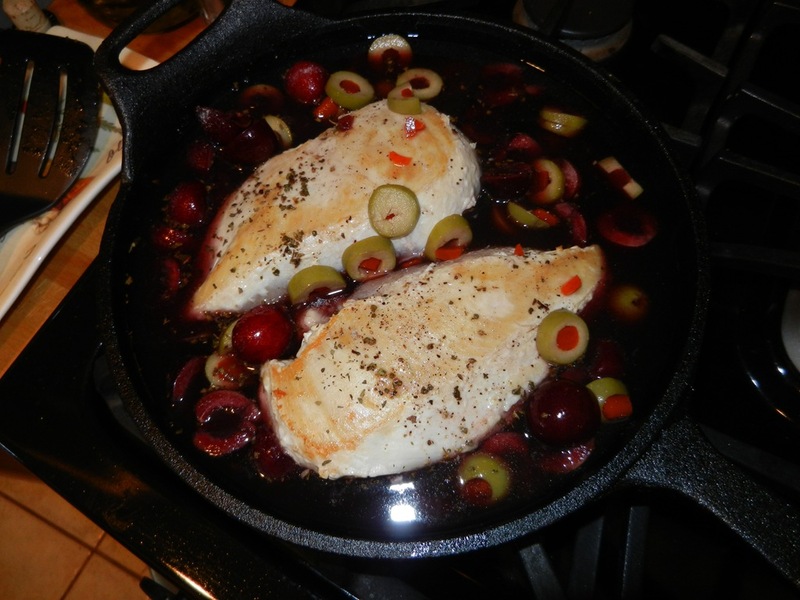 I remembered a chicken dish that Dana’s mom had made for us a while back that had dried cherries and olives, so I thought I would try to make something of that sort except use fresh cherries instead, since that is what we had on hand. Ready to see what I came up with? Season chicken breasts with garlic powder, oregano, salt and pepper. Use cooking spray to lightly coat a large non-stick skillet; cook chicken over medium heat for about 5 minutes on each side, or until the inside is no longer pink; remove from pan. Add the remaining ingredients to the hot pan, bring to a boil, stirring occasionally. 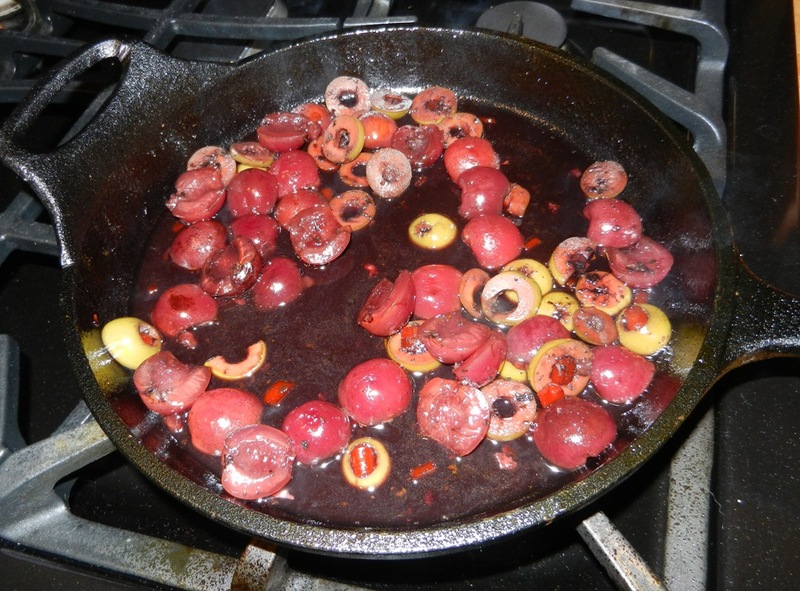 Let boil until liquids reduce and you are left with about 1/4 inch of sauce in the bottom of the pan. Return chicken back to pan, allow to heat through for 5 minutes, and serve warm. This dish paired well with quinoa and would be great with a side of steamed green beans as well. It could be made for date night, a dinner party, or even just a casual Sunday evening. Have fun with it! Question of the Day: What is your favorite go-to summer lunch? This entry was posted in Breakfast, Dinners, Lunch, Recipes, Workouts and tagged Bananas, peanut butter, Protein, Running, Salads by Melanie. Bookmark the permalink.